Hard work, attention to detail, mindfulness, and patience are the essentials for good design. 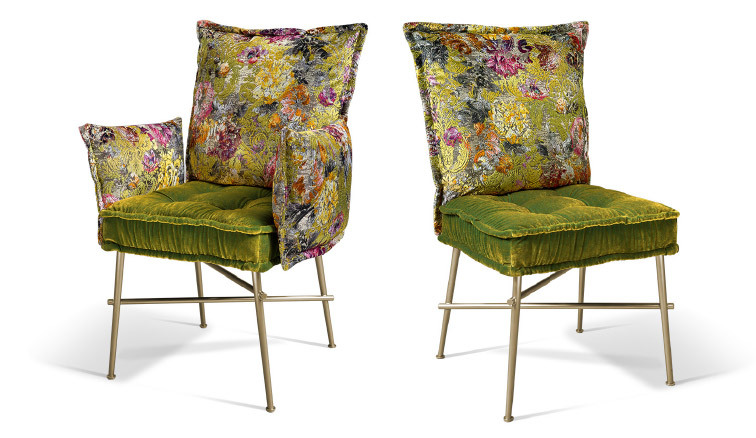 Hand in hand our three designers Marsetz, Kutzera, and Rathai followed these nitty-gritty aspects and fancifully designed the colorful distinctive OHLINDA Chair by paying attention to the tiniest details. And the chairs now go hand in hand with our sculptural-arty dining tables MAUNA LOA and NOFRETETE, designed by Jan Grad. Today we will take a closer look at the OHLINDA Chair and its “making of”. 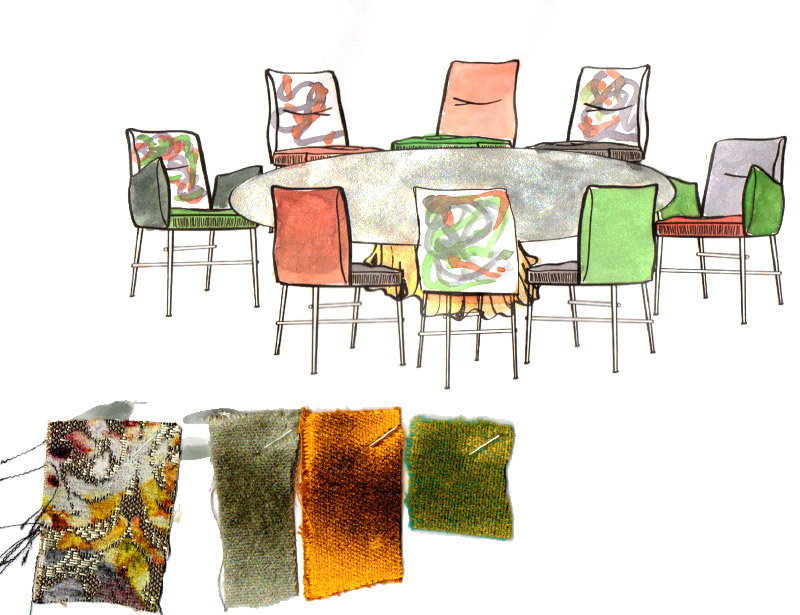 The dining tables and chairs have been developed together. Thus, they do not only correspond visually, but are also perfectly matched for daily use. In addition, another new element in the design of the chair is that its framework has been built entirely from metal instead of using a wooden frame (and this novelty, of course, also needed to be harmonized with the table). Using metal may not sound too spectacular, but up to the development phase of the OHLINDA Chair, this has been totally new to us! Before that, most of our furniture’s frames used to be wooden. Furthermore, lots of work and research was necessary to accomplish the cone-shaped legs with their coin-like ends and iridescent look. And details like the detachable arm- and backrests, the padding of the seat cushions and the seat’s gradient, the width of the tucks as well as many, many more bits and pieces that provide for the chair’s perfect comfort level of seating and its appealing shape. It did not take long after the first hand drawn drafts that we realized we needed a 3D model to define gradients, lengths, and, most of all, OHLINDA’s sophisticated framework. While working on the computerized 3D model, various proportions and relations had been simultaneously tested on a rough wooden construction at our shop. Thus, it was always possible to check and question our 3D computer model and make necessary amendments if needed. Regarding the legs, however, this workflow was impossible. Here we needed to measure to the sixteenth inch, work extremely meticulously, and pay special attention to the CAD drawings before building the metal frame, followed by complex galvanization. 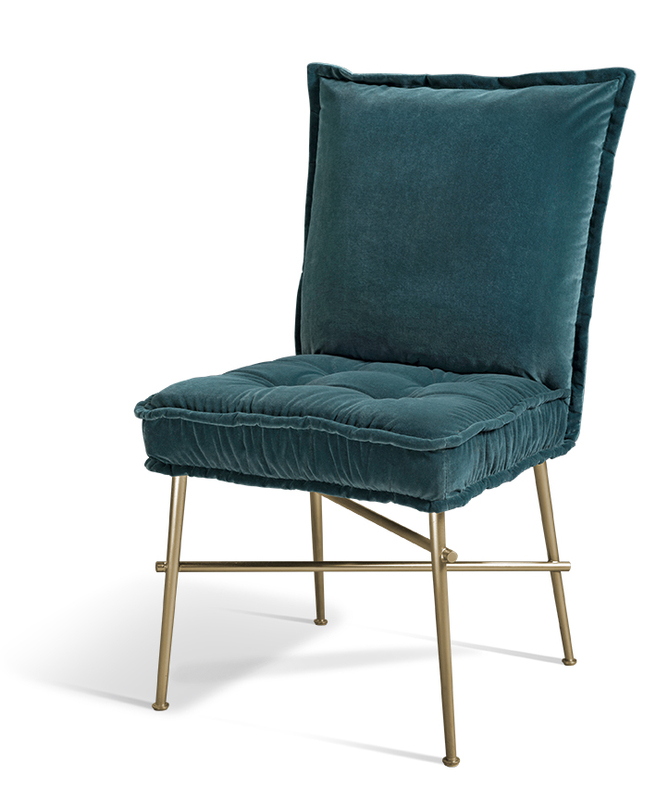 Our OHLINDA chair comes with detachable arm- and backrests. Thus, the covers are exchangeable and can be taken off for cleaning – a definite added value to our customers. And you can create your very own chair, just as you like it! Today we will provide an insight into the development process of the OHLINDA Chair. This chair has its very own expressive dynamics, especially in combination with the extraordinary dining tables. And OHLINDA actually won the German Design Award! Regarding its shape, the chair’s design is based on its bigger sister, the OHLINDA Sofa. Therefore, the traditionally mattress-like seat and the “flying cushions” are also basic elements of the chair. They have been scaled down, additionally sophisticated, and suited to fit the new situation of being “just” a chair. The result has been a new interpretation of the classic armchair, with high-class upholstery and an innovative shape that does no longer show any similarities to the old-fashioned arm-chair. Development and design of the OHLINDA Chair took place hand in hand with the tables MAUNA LOA and NOFRETETE. Together, the table(s) and chairs form a remarkable unit and, in addition, are a perfect match. In the development process, though, each amendment to one part needed to be followed by the other. It is the little details – even though at first these may not look like essential specifications – that need a sophisticated fine-tuning in order to match each other; like for instance the height of the arm rests or the range and shape of the edge of the table. The dissymmetry of the across transverse elements withdraws the rigor from the constructiveness and adjusts perfectly to the surroundings due to reflection of light and color. It is the legs and their unusual shape that give special distinction to the chair’s design. And the legs’ surface with its rainbow-colored, iridescent look was a major part of the development of the chair. 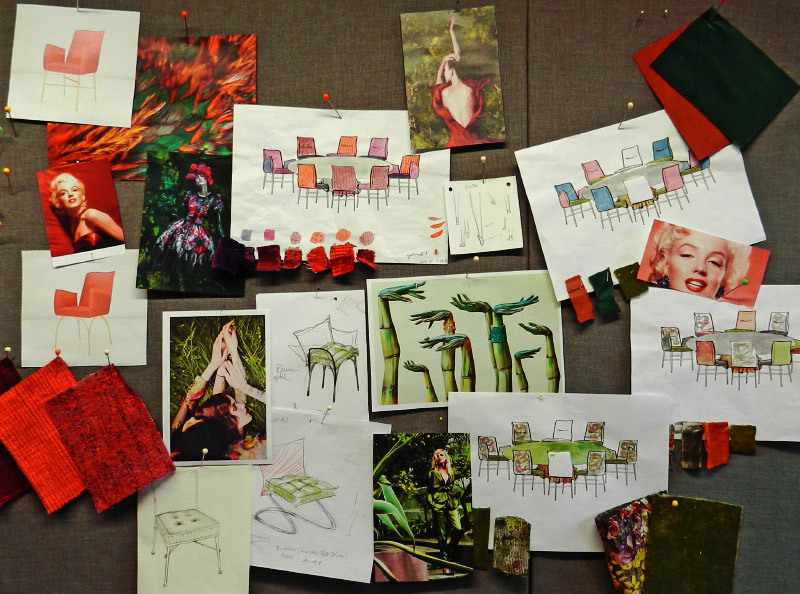 What’s very outstanding regarding OHLINDA’s design is that the legs of each chair are unique in regards to colors and chromaticity. That’s due to the discontinued galvanization, which leads to naturally irregular, slightly cloudy results. We have been very excited about this surface as it shines in various shades, just like our fabrics! OHLINDA HAS SO MANY DIFFERENT FACES…. OHLINDA may be plain-colored, it may have two or even three colors. Blue, red, green, gray, or any combination of colors that will make you happy. 50s style or glamour chic. It is just up to you what your chair will look like. And if you need some assistance in finding your perfect color combination, click here.